Elvis Presley was scheduled to perform in Portland, Maine on August 17th, 1977 to kick off a new leg of his tour — one that had taken him through much of the country already. But the concert, and every one after that, would have to be cancelled. One day before, on the afternoon of August 16th, Presley was found dead in the bathroom of his Graceland mansion in Memphis, Tennessee. He was rushed to Baptist Memorial Hospital, where attempts to revive him were unsuccessful. 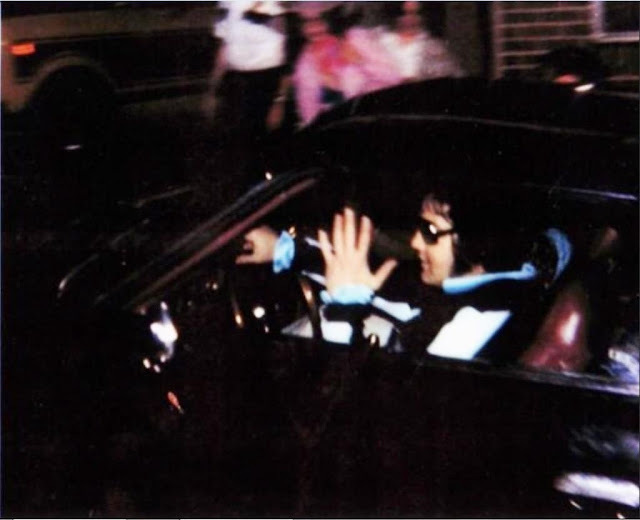 Elvis was returning to Graceland in his Stutz Blackhawk after a late night visit to his dentist Dr. Lester Hofman with girlfriend Ginger Alden. Here’s a photo from the opposite side of the Graceland driveway that shows Alden in the passengers seat. Through the early morning of the 16th Elvis takes care of last minute tour details and relaxes with family and staff. He is to fly to Portland, Maine that night and do a show there on the 17th, then continue the scheduled tour. Elvis retires to his master suite at Graceland around 7:00 AM to rest for his evening flight. By late morning, Elvis Presley is dead of heart failure. The news is announced by mid-afternoon. In a matter of hours the shock registers around the world. After his death, his body lay in state at Graceland. More than 20,000 people flocked to the home to pay their respects. The thousands of mourning Presley fans who had converged on Memphis came from all over the country.